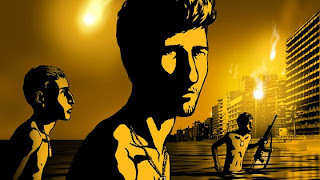 Fourth Row Center: Film Writings by Jason Bailey: On DVD: "Waltz with Bashir"
The Israeli film Waltz with Bashir is a breathtakingly original hybrid of documentary and narrative, fused together with the help of stylish, eye-catching animation. It is a serious film with some horrifying images, a reflection of a troubling time and an indictment of the evils of war, but it is also exhilarating cinema, infused with the energy and enthusiasm of a filmmaker who has found a new and remarkable way to tell a story. Writer/director Ari Folman doesn’t futz around with preliminaries. The opening sequence is a real grabber: drooling, angry dogs running through the streets, leaving destruction and cowering passerby in their wake, accompanied by furious growls and pulsing music. We then discover that this nightmare vision is, in fact, a nightmare; it is being described to Folman by his friend Boaz (voiced by Mickey Leon) and is connected to his memories of the 1982 Lebanon War, in which both men fought. Folman has blocked out his recollections of the conflict, but he later has a detailed vision related to the notorious Sabra and Shatlia massacre; however, he’s not even sure if this is a genuine memory of a moment he has placed himself inside of. Over the course of the film, Folman talks with friends and fellow soldiers, a reporter, and a psychologist to unlock his own experiences—and determine why he has suppressed those memories. The style of the piece is genuinely fascinating; the interviews are shot and edited like conversation scenes in a fictional narrative (albeit with names superimposed, documentary-style), but animated; then, as the subjects talk, their memories are seen. These sequences are basically reenactments, but the beauty and distinctive quality of the animation makes them far more involving and effective than they would have been in live action. The depth and dimension of the frames are remarkable, and the distinctive texture of the animation style (which they call “cut-out animation,” a far more difficult and painstaking process than rotoscoping, which it somewhat resembles) allows Forman and his artists to take advantage of the aesthetic opportunities that animation affords; the transitions, the freedom of movement, the vivid compositions, and the occasional use of hallucinogenic and dream imagery. There are moments here that are visually jaw-dropping: a taxi ride that turns into a journey through the jungle, a slo-mo shot of an RPG taking down a tank, a soldier’s mad dance in the middle of a street that gives the film its title. Folman and his animators also change up the look of the film throughout, occasionally allowing one color (a golden yellow or deep blue, for example) to take over the palate for a scene or sequence, to great effect. The sound design also enriches the environment and frequently augments the narrative, from the startling battle sequences to a dreamlike airport scene with scattered, echoed announcements. The score and music choices also greatly enhance the soundscape, though a couple of composer Max Richter’s cues are too clearly Philip Glass-influenced. But Waltz with Bashir isn’t just empty style. The storytelling is urgent and terse without being pedantic; the natural rhythms of the interviews, for example, feel like well-written dialogue, while the stories they tell are absorbing and often horrifying. This is never more true than in its third act, which explains and dramatizes the Sabra and Shatila massacres via confidently crosscut interviews that hurtle us towards the film’s heartbreaking conclusion. Folman’s final aesthetic choice knocks the wind out of the viewer, removing our distance and making a real story of terror that much more palpable. If a complaint can be lodged against the powerful ending, it’s that it somehow leaves the viewer wanting more—and that’s not a charge I can level against most films these days. With the inordinate number of remakes and reboots and sequels and sequels to remakes glutting the marketplace these days, it’s a real rarity to view a film that we haven’t seen before. But Waltz with Bashir is genuinely fresh and unique, and in spite of its somber subject matter, it is thrilling to watch—it’s a picture intoxicated by its own originality, and that joy is infectious. "Waltz with Bashir" hits DVD and Blu-ray on Tuesday, June 23rd.